Either the USGS created a really preposterous teaser line, or if a real forecast statement, it was a major shock that obliterated recent predictions of ice free summer days or months decades in the future. I was compelled to find out the reality behind the tweet. 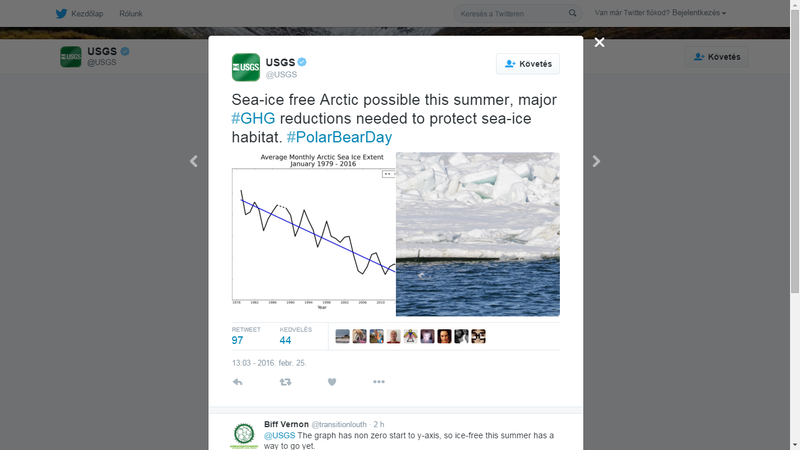 After emailing USGS, the answer they pointed to support the tweet was in a 2013 Geophysical Research Letters paper by Overland and Wang, titled, "When will the summer Arctic be nearly sea ice free?" 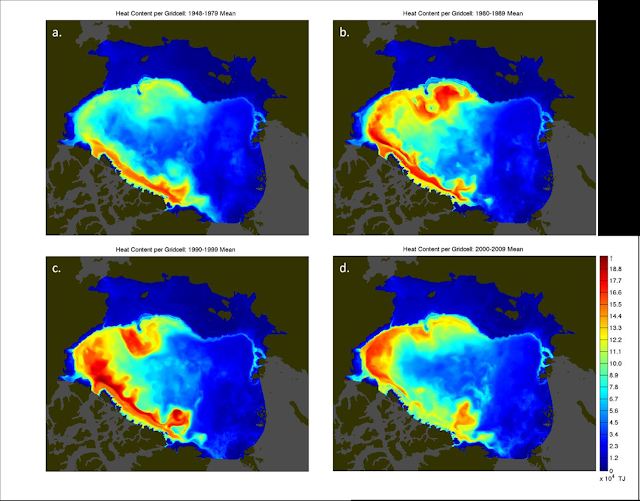 The paper examined three different approaches to determining the first "nearly sea ice-free summer Arctic." The three recent approaches to predictions in the scientific literature examined by the paper were: "(1) extrapolation of sea ice volume data, (2) assuming several more rapid loss events such as 2007 and 2012, and (3) climate model projections." The results of these approaches were for a nearly sea ice-free summer for these three approaches are roughly 2020 or earlier (extrapolation), 2030 ± 10 years (assuming major loss events similar to 2012), and 2040 or later (climate model projections). 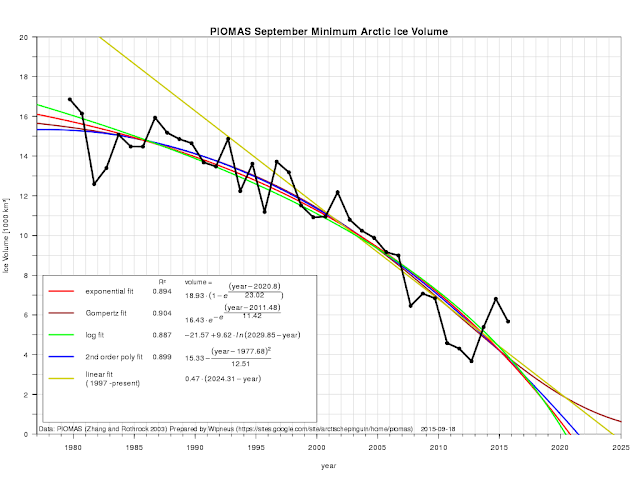 The source of the "sea-ice free Arctic in 2016" statement was from this quote in the "Discussion/Conclusions" section: "Direct extrapolation of sea ice volume, by trendsetters, gives loss projections of 2016 [Maslowski et al., 2012] (Peter Wadhams, 2012, personal communication), which may be minimizing the potential effects of year-to-year variability." Other guesses in 2013 by Arctic sea ice researchers were offered somewhat tongue in cheek at the Economist Arctic Summit in March, 2013, and were not close to a 2016 date. Rear Admiral Jonathan White said 2023 for the first month of less than 15% sea ice concentration. We'll return to the US Navy later. In summary, it is kind of disappointing to see USGS use a 2013 paper to make a 2016 Twitter statement when so much more work has been done in the field of Arctic Ocean and Arctic sea ice modeling. The most recent modeling seems to be the February, 17 2016 NOC efforts. They propose that the first non-ice hardened transpolar shipping is possible in 2080, and "a simulation using NOC ocean models suggests that approximately 40% of Arctic summer sea-ice cover will consist of broken-up ice by the 2040’s. This will allow certain classes of ice-strengthened ships to move directly through the high Arctic, saving time and fuel relative to travelling up the Siberian coast." The actual paper, in Marine Policy, summarized the model and results. 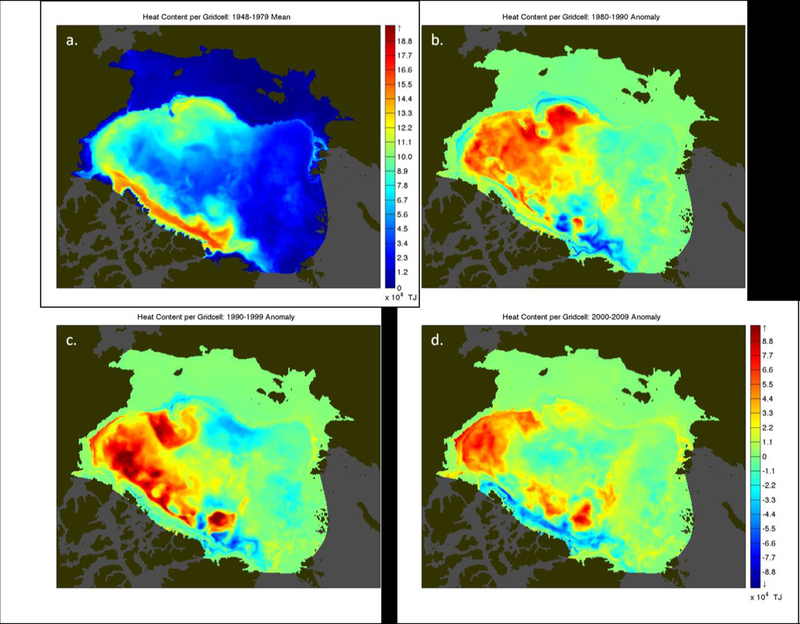 "Here a detailed high-resolution projection of ocean and sea ice to the end of the 21st century forced with the RCP8.5 IPCC emission scenario is used to examine navigability of the Arctic sea routes. In summer, opening of large areas of the Arctic Ocean previously covered by pack ice to the wind and surface waves leads to Arctic pack ice cover evolving into the Marginal Ice Zone. The emerging state of the Arctic Ocean features more fragmented thinner sea ice, stronger winds, ocean currents and waves. By the mid 21st century, summer season sailing times along the route via the North Pole are estimated to be 13–17 days, which could make this route as fast as the North Sea Route." Paper: "On the future navigability of Arctic sea routes: High-resolution projections of the Arctic Ocean and sea ice"
At the time Overland and Wang wrote the paper, they commented, "there is no ideal all-purpose model for the Arctic" Most work above had been done with global climate models that were not detailed enough to handle the range of variables impacting the Arctic Ocean environment. Rear Admiral Jon White likely had knowledge of the Naval Postgraduate School Arctic Sea Ice Modeling project called RASM. So what is RASM? According to the Naval Postgraduate School, RASM is, "The Regional Arctic System Model is a limited-area, fully coupled ice-ocean-atmosphere land model (Maslowski et al. 2012). 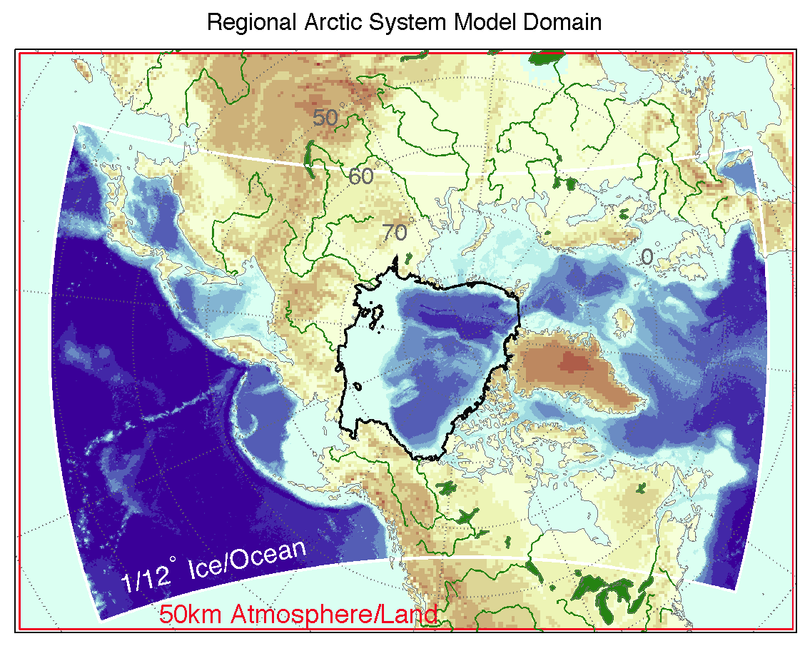 It includes the Weather Research and Forecasting (WRF) model, the LANL Parallel Ocean Program (POP) and Community Ice Model (CICE) and the Variable Infiltration Capacity (VIC) land hydrology model configured for the pan-Arctic region." It covers the entire Arctic ecosystem. In 2013, Naval Postgraduate School student Navy Lt. Dominic DiMaggio was interviewed by Monterey County NOW, a local media source. 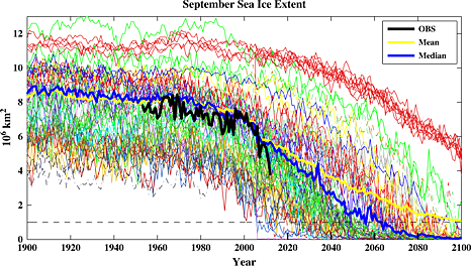 In the interview, they ran a RASM model that forecast summer, 2016 as ice free. According to the article, Di Maggio "casually points to a graph showing a RASM projection for melting Arctic sea ice, a phenomenon that occurs every summer but has been accelerated by climate change: By the summer of 2016, the Arctic Ocean could be ice-free, opening the door to vast reserves of fossil fuel, and eventually, freeing up a shipping lane between Europe and Asia. "NPS Professor Wieslaw Maslowski, who leads the team of researchers behind RASM, says 2016 is at “the lower bound” of the current range of projections, while DiMaggio calls it “an aggressive interpretation” of RASM." Much has happened with RASM since then. He presents a cogent argument demonstrating that Arctic sea ice melt has been accelerated by Atlantic Ocean heat content increasing in the Arctic, using observation, including tether data to substantiate his modeling. It reveals that in areas of the Western arctic, where much multi-year sea ice ended up in 2014 and 2015, there has been greatest amounts of ocean heat content increase. The following are figures 24 and 25 on pages 104-105 to illustrate that heating and anomaly increase from 1948-2009. 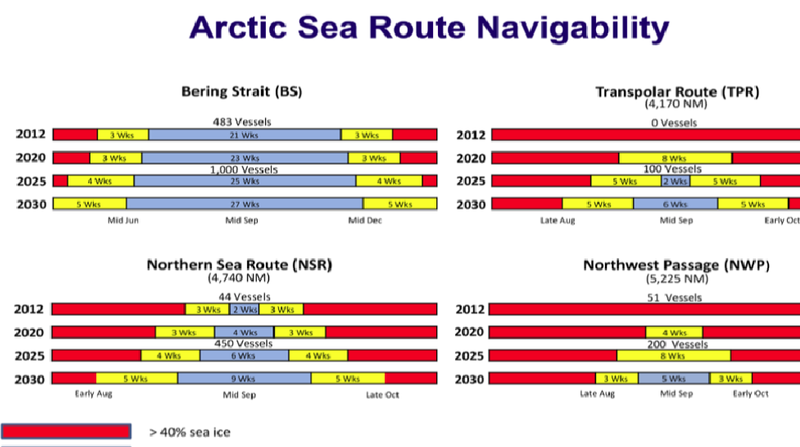 Additionally, in March, 2014 the US Navy released its 2014-2030 Arctic Road Map, which detailed shipping and sea ice melt expectations: It is likely that part of this work was influenced by RASM results. "Reduction of Arctic Ocean sea ice is expected to continue, and major waterways will become increasingly open. By 2020, the Bering Strait is expected to see open water conditions up to 160 days per year, with 35-45 days of shoulder season. The Northern Sea Route will experience up to 30 days of open water conditions, with up to 45 days of shoulder season conditions. Analysis suggests that the reliable navigability of other routes, including the Transpolar Route and the Northwest Passage, is limited in this timeframe. There will be shoulder season route variability based upon ice age, melt, and movement." "By 2025, the Bering Strait will see up to 175 days of open water (and 50-60 days of shoulder season). These figures increase to 190 days of open water (and up to 70 days of shoulder season) by 2030. For the Northern Sea Route, predictions are for up to 45 days of open water (with 50-60 days of shoulder season) by 2025, increasing to 50-60 days of open water by 2030 (with up to 35 days of shoulder season conditions). This period will begin to see greater accessibility of the Transpolar Route, which is forecast to be open for up to 45 days annually, with 60-70 days of shoulder season. Analysis suggests the reliable navigability of the Northwest Passage will continue to remain limited in this timeframe." "Beyond 2030 environmental conditions are expected to support even greater and more reliable maritime presence in the region. Major waterways are predicted to be consistently open, with a significant increase in traffic over the summer months. The Northern Sea Route and Transpolar Route should be navigable 130 days per year, with open water passage up to 75 days per year. 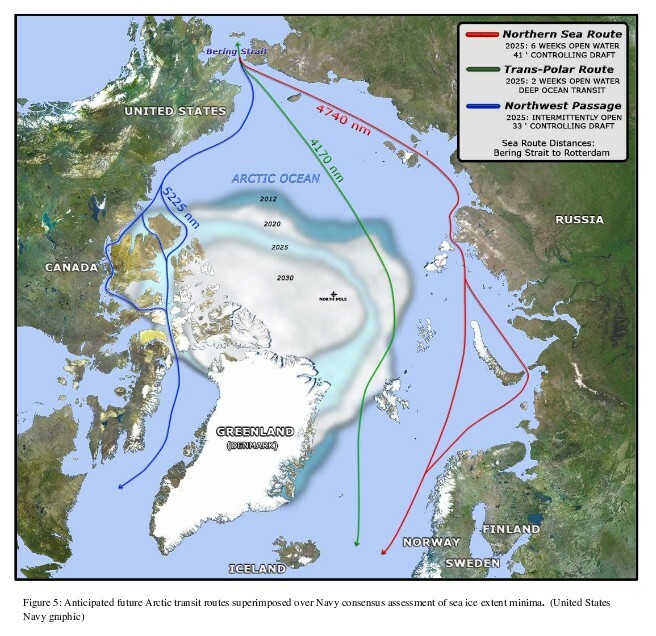 The Northwest Passage will be increasingly open during the late summer and early fall." Graphed, those numbers and the resulting shipping traffic look like this:. The greyish-blue is less than 10% sea ice - open water. But what about after 2030? "Far-term: Beyond 2030. In the far-term, environmental conditions are expected to support even greater and more reliable maritime presence in the region. Major waterways are predicted to be consistently open, with a significant increase in traffic over the summer months. The Northern Sea Route and Transpolar Route should be navigable 130 days per year, with open water passage up to 75 days per year. RASM continues to develop and improve. It is scheduled to become more operationally available in a joint project between ESRL and the NPS teams this year, based upon a February 2, 2016 presentation.